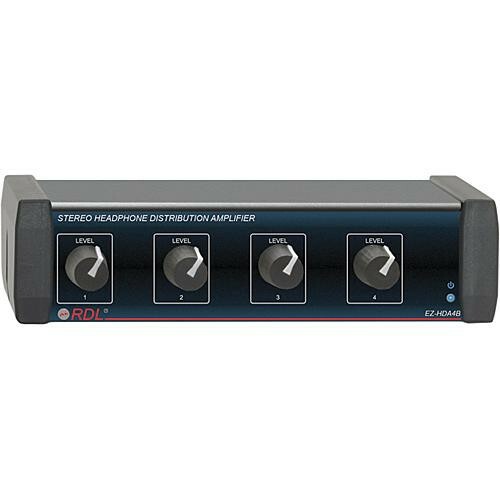 The RDL EZ-HDA4B Stereo Headphone Distribution Amplifier features 4 separately amplified 1/8" (3.5mm) mini headphone outputs, level controls on each output and RCA phono, 1/8" (3.5mm) Mini and 1/4" Phone Stereo inputs on the rear. Although the unit accepts input signal from 1 of the available 3 inputs, the choice of inputs makes the EZ-HDA4B a flexible monitoring solution for recording studios, audio installations, home applications, etc. The compact enclosure takes up just 1/3 of a 19-inch rack space. Box Dimensions (LxWxH) 10.2 x 7.2 x 2.4"